TED is celebrating five years of 900+ video's being online. 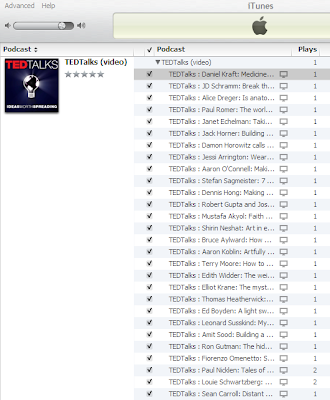 TED Blog asked few questions in their post - "Have you watched all the TED Talks?" How did you find TEDTalks? At what point did you set the goal: “I want to watch every TEDTalk”? Very first batch of talks released had me hooked. I've watched regularly throughout 5 years. Never been behind more than ~15 in iTunes playlist. How are you keeping track? What’s a talk you think you would not have watched without this goal? What’s something you learned from this experience? To watch every TED Talk, you may have to give up your cable-Television, else it's tough. And if possible blog about your favorite ones. (example - tag). Best of Luck to everyone who is aiming to clear their 5-year backlog.